This is a very sad day for the World of Football and esp. Manchester United Fans. Sir Alex Ferguson, after serving 27 years as manager of the club, finally retired at the age of 71. While people are still in shock and awe over the news, we look at silverware loaded time of the the great Scott at Old Trafford. In the year 1986, Manchester United hired a not so famous manager known as Alex Ferguson and was given the opportunity to build a club and a brand that will live forever. With the constant support from owners and board members, this not so esp. manager became the most celebrated manager in the history of Club Football. Here is his record at Manchester United. When he completes his career as Manchester United manager, he would have managed the Club for a record 1500th time. The scot is the among the most famous managers of Manchester United if not the Greatest. The Scot took over the club when United hadn't won any trophy for 19 years and Liverpool were the giants of English Football. From being ‘almost sacked’ in his early sessions at United, Sir Alex Ferguson knocked Liverpool off the Perch. His drive to make United the Best team made him a fierce rival of the Invincible Arsenal of Arsene Wenger and the Brilliant Chelsea of the Special One, Jose Mourinho. He also Locked Horns with the Italian who managed the Noisy Neighbors of United, Manchester City. 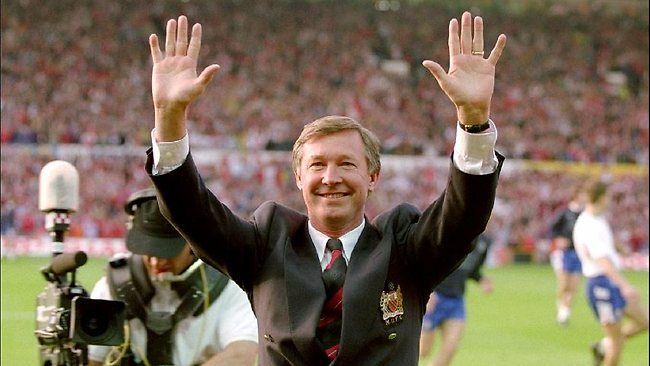 Ferguson received the Knighthood in 1999 after winning the treble. The famous United team beat the then dominant Bayern Munich to Win the Champion’s league and with the FA Cup and league already in hand, it was a season United fans will always remember. He again won the Champions league by defeating Chelsea in the Final in 2008. The Rise of Barcelona and their 2 consecutive thumpings of Manchester United in Champions League Finals made Ferguson motivated to make a team that could conquer Europe. After a few years, he managed to make one with Robin Van Persie being the star striker. Unfortunately, the United Side was eliminated by Real Madrid in the knockout stages due to a referee error.